Disclaimer: This post is mostly focused on Marvel, which is not intended to be discriminatory towards DC. It's just that I've only read Marvel comics so far because I'm a comic newbie. Disclaimer #2: Speaking of, I am a comic newbie. I have only delved into a few comics. Reader discretion is advised. Despite being a fan of the MCU (Marvel Cinematic Universe) for the past four years, up until recently, I hadn't delved into the fascinating world of comics. I know, I know. It's almost shocking--how could I let such a great resource remain untapped? Part of the problem was that I didn't know where to start. If that's you, never fear! Here are a few tips I've learned about jumping into the world of comics. You don't have to start at the beginning. If you're a purist like I was, you probably felt an urge to start at the very beginning of any given story line of comics. I did, and I started by reading the very first issue that Thor debuted in... which brought me back to 1952. There wasn't anything wrong with that, but it didn't hook me like some of my newer comic reads have. It took me a long time to get back into comics after my so-so attempt to read the Thor comics. I just thought that comics weren't for me, which wasn't the case--I just hadn't found the right comics. Pick a story and/or characters that speak to you. The first comic I read all the way through was Spider-Gwen, Vol. 0: Most Wanted?. I chose it because I'm a Spider-man fan and I loved Emma Stone's portrayal as Gwen Stacy in both The Amazing Spider-man movies. A genderbent Spider-man seemed right up my alley. Additionally, the cover seemed cool, colorful, contemporary, and fun, so I had to pick it up. I wasn't disappointed! Because I already had a connection with Gwen, I connected to her comic story even more. Due to my knowledge of the Spider-man universe and Gwen Stacy herself, it wasn't too hard for me to fill in the blanks of Gwen's character and/or story line. All the comics I've read since then have been ones I've connected to. I read Ms. Marvel because I loved the idea of a young, diverse superhero (and I've heard really good things about Kamala Khan). I read The Defenders because of my investment in the Netflix shows. I just finished Young Avengers vol. 1 because as a young fan of The Avengers, it's right up my alley. Up next on my to-read list are some of my favorite characters' comics: Iron Man, Captain America, Daredevil, etc. Whether you're interested in Marvel or DC, using their film universes as a good starter point to figure out which characters you find the most interesting may help you choose the perfect comic. I'll admit after my failed attempt to read the Thor volume my enthusiasm for comics waned. I wasn't sure if they were for me. The thing about comics, though, is that there's something out there for everyone. There's Marvel and DC. (and P.S., you don't have to choose just one of them!) There's graphic novels and manga if you're not into superheroes. There are even Star Wars comics. (About Poe Dameron, no less!) 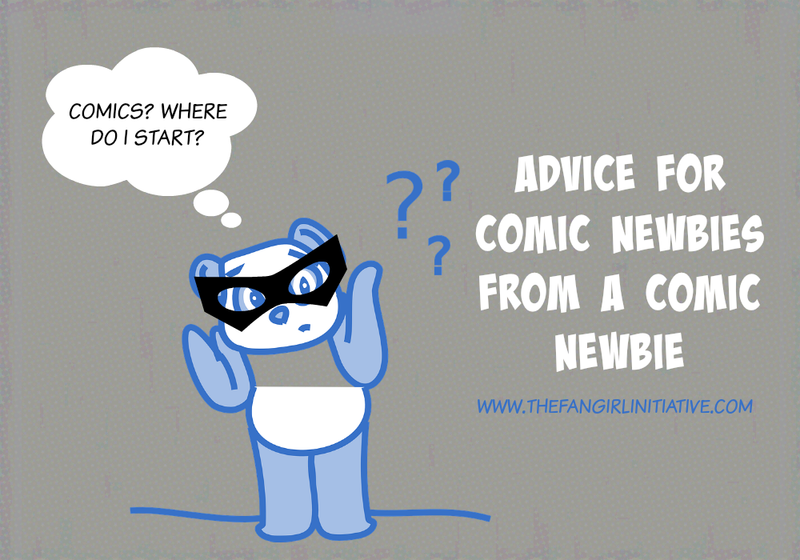 If you haven't found your comic yet, don't get discouraged! It's out there somewhere. Enlist your comic-loving friends to recommend some that you'd like or peruse Goodreads to find your perfect fit. If you're looking for my recommendations, here are the comics I've loved so far (which also happen to be all the comics I've read so far). If DC is more your style, here are some recommendations from our staff! If you aren't a comics fan, here's why you should be! And don't forget to check out the recommended links sprinkled throughout this post. In summary, the comic world can be a daunting place, but it is so rewarding. What are you waiting for? Pick up a comic today! Are you a comic newbie? If not, what are your tips to those of us new to the comic scene? I love this! 0 issues are the perfect place to start! AND with DC's rebirth series out now-- it's giving a new wave of comic lovers a really good starting point and a look into what the characters have been up to in recent comic canon! So cool! Thanks, Molly! I'll have to check those out to get started with DC. I love how there are so many comics being put out that help new comic lovers take their first step into the genre. It's super helpful!